In hospital practice, pleural aspiration (thoracocentesis) and chest drain insertion may be required in many different clinical settings for a variety of indications. Doctors in most specialities will be exposed to patients requiring pleural drainage and need to be aware of safe techniques. There have been many reports of the dangers of large-bore chest drains and it had been anticipated that, with the previous guidelines, better training and the advent of small-bore Seldinger technique chest drains, there would have been an improvement. Unfortunately the descriptions of serious complications continue, and in 2008 the National Patient Safety Agency (NPSA) issued a report making recommendations for safer practice.1 These updated guidelines take into consideration the recommendations from this report and describe the technique of pleural aspiration and Seldinger chest drain insertion and ultrasound guidance. Much of this guideline consists of descriptions of how to do these procedures but, where possible, advice is given when evidence is available. Studies of clinical practice have shown that there is a wide variation in the knowledge and skills of doctors inserting chest drains. In a published study3 where doctors were asked to indicate where they would insert a chest drain, 45% indicated they would insert the drain outside of the safety triangle, with the majority of incorrect answers being too low. Knowledge of the correct position was higher in the group with cardiothoracic surgery experience and higher in doctors with competence to insert drains without supervision. Training should include a theoretical component describing the risks and technique, as outlined in this document, prior to assessed manikin practice and finally supervised procedure until considered competent. In the UK it is currently part of the curriculum for core medical training and trainees should be expected to describe the procedure and complications in an examination. The trainee should ensure each procedure is documented in their log book and signed by the trainer. A Directly Observed Practice (DOP) assessment should be completed in support of this. Training for thoracic ultrasound should follow the principles set out by the Royal College of Radiologists and is described in greater detail later in this document. These guidelines will aid the training of junior doctors in these procedures and should be readily available for consultation by all doctors likely to be required to carry out pleural aspiration or chest tube insertion. An algorithm for the insertion of a chest drain is shown in figure 1. Algorithm for the insertion of a chest drain. Complications of most surgical procedures are higher when performed after midnight. Most pleural procedures do not need to be performed as an emergency and therefore should not be carried out overnight except in the case of significant respiratory or cardiovascular compromise. It may be considered in certain circumstances that pleural aspiration is safer than a chest drain. Empyema and wound site infections are significant complications of pleural procedures. A large area of skin cleansing should be undertaken using two applications of alcohol-based skin disinfectant (or other if recommended by the local infection control team), allowing it to dry in between applications. The procedure should be carried out in a clean area appropriate for such procedures. Patients known to be receiving anticoagulants or in whom there is a suspected coagulopathy (eg, liver failure) should have their prothrombin time (PT) or international normalised ratio (INR) measured prior to a non-urgent pleural procedure. In the case of a tension pneumothorax, it may be necessary to insert a drain first before correcting an abnormal INR. McVay et al7 retrospectively reviewed 608 cases undergoing paracentesis or pleural aspiration and found that mild coagulopathy, defined as an INR <1.5 or platelet counts 50–99 109/l, did not adversely affect the risk of bleeding with a fall in haemoglobin of 2 g/dl occurring in only 3.1% and 0.2% requiring transfusion. If a patient has abnormal coagulation and requires an invasive pleural procedure, the advice of the local haematologist should be sought regarding the correct action needed to normalise the clotting. Pleural aspiration describes a procedure whereby pleural fluid or air may be aspirated via a system inserted temporarily into the pleural space. This may be for diagnostic purposes (usually removing 20–50 ml fluid) or therapeutic to relieve symptoms. In the literature it is varyingly called thoracocentesis, thoracentesis or pleural aspiration. The indications for pleural aspiration are shown in box 1. * Refer to specific guidelines for further detail. Before performing a pleural aspiration, operators should ensure documented consent is obtained and that they are either competent or supervised to do the pleural aspiration. They should be aware of the indication for the procedure, whether it is diagnostic or therapeutic and have all equipment ready. The consent procedure should encompass the indications for the procedure, alternatives to the procedure and the common and serious complications. A number of factors have been reported to increase the frequency of complications following pleural aspiration. The broadest agreement across the studies examined was that increased operator experience and the use of image guidance reduced the frequency of complications. A fixed effects meta-analysis calculation of the complication frequency across all the studies examined according to these two factors is shown in table 1. Other factors such as the needle size used and the volume of fluid aspirated have been shown in a few studies to have an effect and are discussed below. Underlying chronic obstructive pulmonary disease8, previous radiotherapy9 and previous pleural aspiration10 have also been suggested as risk factors in individual studies and more evidence is required before recommendations can be made. We conclude that, if an ex vacuo pneumothorax occurs after drainage of a pleural effusion due to non-expansile or trapped lung, the pneumothorax should not routinely be drained. Drainage of the pleural effusion if it recurs may bring symptomatic relief. Indwelling pleural catheters may be useful in this context. Only one case of injury to a solid viscus was found in the context of a cohort or case series,14 although several examples of other visceral injuries are published in case reports. Despite the low reported frequency, studies of the accuracy of clinically placed pleural aspiration sites have revealed significant potential for visceral injury15 16 and this is discussed further in the section on image guidance (below). A recent chest x-ray is necessary to confirm the indication for the procedure and the side of the pathology. This should be correlated with the clinical signs. The only exception should be the case of a tension pneumothorax. A large proportion of these failed blind procedures are probably due to inaccurate clinical site selection. In a study by Diacon et al,15 clinicians were only able to identify a site for a pleural aspiration in 67% of patients with a pleural effusion. In the cohort where a site was identified, 15% were inaccurate and would have resulted in puncture of the lung, liver or spleen. Where the clinician was unable to identify a site for aspiration, ultrasound localised a suitable site for aspiration in 54%. Overall, ultrasound prevented potential organ puncture in 10% of the procedures and increased the rate of accurate sites by 26%. Thoracic ultrasound or other imaging is very important following a failed blind pleural aspiration. In a study of 26 patients who had a failed clinically-guided pleural aspiration, 38% had the procedure performed at the incorrect site, 31% had no pleural fluid present, 11% had loculations and 11% had intervening parenchymal consolidation or tumour. Factors associated with failure were a small pleural effusion, loculations and a sharp costophrenic angle on the chest x-ray. Operator inexperience was not associated with failure. Ultrasound-guided pleural aspiration was subsequently successful in 15 of the 17 patients in whom it was attempted.16 Similarly, Kohan et al demonstrated the efficacy of ultrasound-guided pleural aspiration following failed clinical procedures.21 Therefore, if a clinically localised pleural aspiration fails, image guidance should be performed and no further clinical attempts should be made. Thoracic ultrasound is also useful in the presence of unilateral ‘white-out’ or opaque hemithorax on the chest x-ray. In a prospective study of 50 patients, nine had no pleural effusion present on thoracic ultrasound23 thereby avoiding inappropriate pleural aspiration and potential procedure-related injury. It could be argued that thoracic ultrasound may not be necessary when aspirating a large pleural effusion that does not cause complete opacification of the hemithorax. In a randomised controlled trial comparing blind pleural aspiration against ultrasound guidance, there was a significantly higher incidence of dry taps in the presence of a small pleural effusion (obliterating less than half of the hemidiaphragm) and loculated pleural effusion. There was no difference in the rate of dry tap in the presence of a large pleural effusion.21 However, even in this instance, image guidance will reveal underlying abnormalities that are not apparent on plain film radiology such as cardiac enlargement or displacement, a raised diaphragm or adherent lung. Overall, ultrasound-guided pleural aspiration has been shown to increase the yield and reduce the risk of complications, particularly pneumothoraces and inadvertent organ puncture. However, it should be noted that ultrasound may not reduce the incidence of laceration of the intercostal vessels because they are not visualised on ultrasound.24 The evidence leads us to conclude that, wherever possible, site selection for all pleural aspiration should be ultrasound-guided. Ultrasound guidance is strongly recommended when attempting to aspirate any pleural effusion. It is even more important when aspirating small or loculated pleural effusions where there is a near or completely radio-opaque hemithorax, particularly in the absence of mediastinum shift away from the side of the lesion or when a clinically-guided attempt has been unsuccessful. However, the use of image guidance does not replace the need for clinical judgement, especially when siting the needle within the intercostal space. The use of ultrasound also requires training and expertise as described later in this document. In determining the correct patient position and site of insertion, it is important for the operator to be aware of the normal anatomy of the thorax and the pathology of the patient. Patient position is dependent on the operator preference and the site of the pathology. In the case of a posterior lying locule, this may be specific to the image-guided spot where fluid is most likely to be obtained. In most circumstances, however, the site of insertion of the needle is either in the triangle of safety (figure 2) or the second intercostal space in the mid-clavicular line. The patient may therefore either sit upright leaning forward with arms elevated but resting on a table or bed, thereby exposing the axilla, or lying on a bed in a position similar to that described in the section on chest drain insertion below. The ‘triangle of safety’. The triangle is bordered anteriorly by the lateral edge of pectoralis major, laterally by the lateral edge of latissimus dorsi, inferiorly by the line of the fifth intercostal space and superiorly by the base of the axilla. The needle is inserted in the space just above a rib to avoid damaging the neurovascular bundle. It is common practice to insert the needle more posteriorly for a pleural aspiration, but it should be noted that the neurovascular bundle may not be covered by the lower flange of the rib in this position25 and a more lateral or anterior site of insertion is considered safer. Pleural aspiration should be aseptic and therefore sterile gloves, a sterile field, skin sterilising fluid and a clean dressing are needed. For a simple diagnostic pleural aspiration a 21G (green) needle and a 50 ml syringe is sufficient to obtain a sample. If aspiration of air or a larger sample of fluid is required (therapeutic tap), there are a number of commercially available kits to perform a pleural aspiration although it is often performed in the UK by adapting easily available equipment for the purpose. Most commonly this is an intravenous cannula attached to a three-way tap and tubing/syringe. The tip of the tubing can then be directed into a suitable receptacle for sampling or disposal, or an underwater seal if required. Empyema is a serious and avoidable complication of pleural aspiration, the risk of which is greater with multiple attempts. It is recommended that strict asepsis should be employed, especially when carrying out therapeutic aspirations. The use of large-bore needles for pleural aspiration probably increases the risk of developing post-procedure pneumothorax. In addition, if a vascular or visceral injury does inadvertently occur, the use of a large-bore needle is likely to result in more damage than a small-bore needle. A reference for needle and chest drain sizes can be found in appendix 2 in the online supplement. Thoracic ultrasound should be performed before undertaking pleural aspiration. In the case of a diagnostic pleural aspiration, a syringe attached to a green needle is inserted into the pleural space using the technique described below and 20–50 ml of fluid withdrawn and sent for investigations as discussed in the guideline on investigation of a pleural effusion. Local anaesthesia is not required for a simple procedure but should be considered if difficulty attaining the pleural space is likely (ie, with an inexperienced operator or if the patient has a thick chest wall). Skin cleansing and an aseptic technique should be used. In the case of a therapeutic aspiration, local anaesthetic should be administered as described in the section on chest drains below. The pleural space should be aspirated with the needle used to administer the local anaesthetic and the depth of the pleural space can then be confirmed. The aspiration needle or cannula should then be advanced into the chest, aspirating continually until the pleura is breached and air or fluid are withdrawn, paying close attention to the depth of the pleural space. The cannula should then be attached to a three-way tap and fluid/air withdrawn into the syringe and expelled via the free port of the three-way tap. This may be into a bag or jug for fluid, or into air or a tube inserted into a bottle under water acting as a one-way seal to prevent air being entrained. This process should be repeated and continued until the procedure is terminated. The cannula is then removed and a simple dressing applied. The maximum volume which can be aspirated is subject to debate as there is concern that re-expansion pulmonary oedema (RPO) may occur and that the frequency of post-procedure pneumothorax may increase if larger volumes of fluid are withdrawn. The rate of RPO has been quoted as being anywhere between 0.2% and 14%. In more recent studies30–32 the incidence of clinical RPO is <1% but asymptomatic radiologically-apparent RPO may be slightly more frequent. It is unlikely to occur if <1 l is withdrawn, but it is less clear how cases at risk of RPO can be predicted at higher volumes. It is possible that the association between the volume of fluid drained and the increase in occurrence of post-procedure pneumothorax is due in part to underlying trapped lung. If a greater volume of fluid is drained, then an underlying trapped lung is more likely to be revealed. This mechanism of post-aspiration pneumothorax has been discussed previously in the section on complications. Although the safe aspiration of much larger volumes has been documented, it is also clear that complications are uncommon when aspirating <1.5 l. This is therefore the recommended volume to be aspirated at one attempt. Pleural manometry is not currently in clinical practice in the UK, there are no comparative studies and there is no commercially-designed equipment specific for this procedure. We conclude that the physician performing an aspiration can usually predict the presence or absence of a clinically significant post-procedure pneumothorax and therefore a post-aspiration chest x-ray is not routinely needed. The use of vacuum bottles during aspiration can hinder the operator's ability to detect inadvertently aspirated air. A chest drain is a tube which is placed in the pleural space to drain its contents (fluid or air) and remains in place until drainage is complete. The indications for chest drain insertion are shown in box 2. Written consent should be obtained for chest drain insertions, except in emergency situations. The General Medical Council (GMC) guideline43 ‘Consent: Patients and Doctors Making Decisions Together’ states that it is the responsibility of the doctor carrying out a procedure or an appropriately trained individual with sufficient knowledge of a procedure to explain its nature and the risks associated with it in a language which is understandable to the patient. It is within the rights of a competent individual patient to refuse such treatment, and patients without mental capacity should be treated following the appropriate advice given in the GMC guidance. As insertion of a chest drain is a procedure associated with significant risk, consent should be obtained in writing and should include the commonest and most serious complications as outlined below and also the possibility of treatment failure. In the case of an emergency when the patient is unconscious and the treatment is lifesaving, treatment may be carried out but must be explained as soon as the patient is sufficiently recovered to understand. An information leaflet should be given where available prior to the procedure (see appendix 3 in online supplement). The most commonly occurring complications in the studies examined are shown in tables 2 and 3. Pneumothorax is also commonly reported, but the aetiology is multifactorial ranging from lung injury and introduction of air to ‘trapped lung’, which is not regarded as a procedural complication (see section on pleural aspiration). Simple pneumothoraces are easily dealt with by the chest drain itself and, where possible, we have reported lung injury under the ‘injury’ column in tables 2 and 3. Liu et al44 studied pneumothorax treatment and reported three cases of haemothorax as a complication; these are also reported in the ‘injury’ column. Tables 2 and 3 are separated into small-bore drains and large-bore drains for ease of reference, although they cannot be directly compared owing to significant differences in the insertion technique, the use of image guidance and the indications for the drains to be inserted. These differences are described in more detail in the table in appendix 4 in the online supplement. There is also a range of operator experience in the studies with a tendency for small-bore image-guided drains to be inserted by more senior operators; these factors are likely to explain the different malposition rates for the two types of drain. The rate of empyema and wound infection in trauma cases has been reported to be as high as 5.8–13%. A number of studies,62–68 including a meta-analysis69 70 of 507 cases of thoracic trauma requiring chest drainage comparing empirical antibiotics with placebo, showed an absolute reduction in infection and empyema in the treatment group of 5.5% (OR 5.27 in favour of giving antibiotics). It should be noted, however, that these studies were of different types of thoracic trauma (blunt and penetrating) and occurred in predominantly young male patients in a variety of settings. In addition, the environment in which the chest drain was inserted may not have been fully aseptic in some cases. The antibiotics used have varied from study to study, but all have shown a reduction in the infection rates. The studies are summarised in the evidence table which is available on the BTS website at www.brit-thoracic.org.uk. The use of antibiotic prophylaxis in medically inserted chest drains has not been studied but, given the low rates of infection and the risk of hospital-acquired infections such as Clostridium difficile and the older age group of these patients, it cannot be recommended at this time. The equipment required is shown in box 3. Equipment may also be available in kit form. Traditionally, large-bore drains were recommended and inserted using a blunt dissection technique. With the increased availability of small drains and use of the Seldinger technique this has now become the most common mode of chest drain insertion, such that many trainee doctors are not able to insert large-bore drains except emergency doctors or surgeons who have undergone ATLS training. The relatively low risk of complications with small-bore drains inserted using the Seldinger technique is generally accepted, but there is greater debate regarding the effectiveness of small-bore drains in various clinical situations. One of the arguments put forward for using larger drains is the greater flow that is possible as predicted by Poiseuille's law. However, the maximum rate of drainage possible through a drain is unlikely to be important when draining a pleural effusion when the rate of flow is usually deliberately controlled. Small-bore chest drains inserted by the Seldinger technique are therefore recommended as first-line therapy for spontaneous pneumothoraces and iatrogenic pneumothoraces; however, a larger bore drain may be needed in cases of very large air leaks, especially postoperatively. We recommend that small-bore drains are the first choice for draining pleural effusions. Premedication could be with an intravenous anxiolytic (eg, midazolam 1–2 mg titrated to achieve adequate sedation) or an analgesic (eg, 2.5 mg intravenous morphine given immediately prior to the procedure or 10 mg oromorph 1 h prior to the procedure). No single technique has been shown to be clearly superior. Both these classes of drugs may cause respiratory depression and all patients who receive them should be observed. Patients with chronic obstructive pulmonary disease are particularly at risk and require extra care when using these drugs. Reversal agents (eg, naloxone or flumazenil) are occasionally necessary and should always be immediately accessible if using intravenous opiates or benzodiazepines. Intravenous access should be maintained throughout the procedure and oxygen saturation should be monitored continuously. Sedation should allow the patient to remain conversant throughout the procedure and should be combined with a sensitive explanation during the procedure with reassurance. While the use of atropine as part of premedication for fibreoptic bronchoscopy has been assessed, no controlled trials of its use in chest tube insertion were found although it is advocated in some centres. Case reports of vasovagal reactions and a death due to vagal stimulation following tube insertion may support its use as premedication. The preferred position for standard drain insertion is on the bed, slightly rotated, with the arm on the side of the lesion behind the patient's head (figure 3A) or on the hips to expose the axillary area or in the lateral decubitus position (figure 3C). An alternative is for the patient to sit upright leaning over an adjacent table with a pillow under the arms (figure 3B). Common patient positions for chest drain insertion. (A) Semi-reclined with hand behind head. (B) Sitting up leaning over a table with padding. (C) Lateral decubitus position. Insertion should be in the ‘triangle of safety’ illustrated in figure 2. 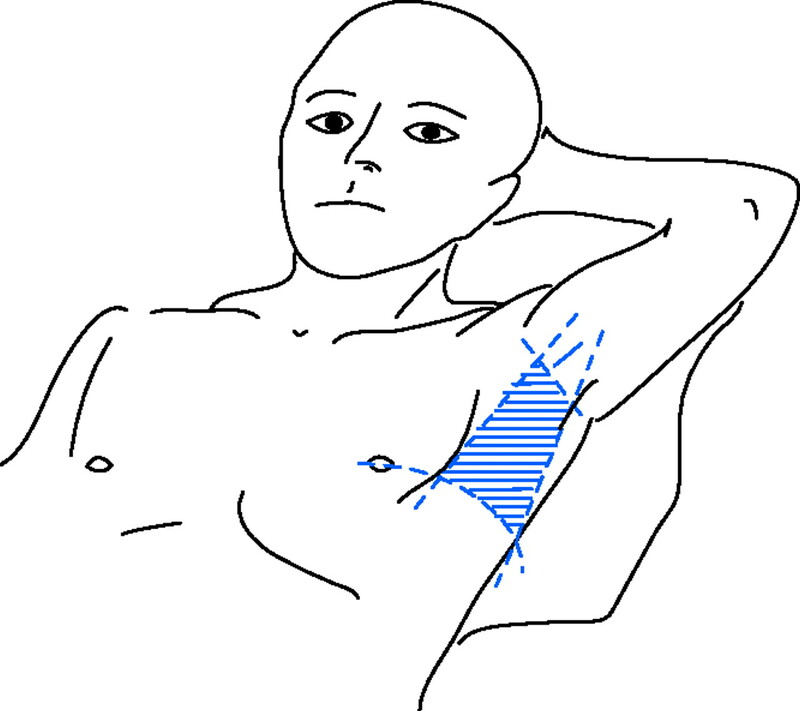 This is the area bordered by the lateral edge of the latissimus dorsi, the lateral border of the pectoralis major muscle and superior to the horizontal level of the fifth intercostal space. This position minimises the risk to underlying structures (eg, internal mammary artery) and avoids damage to muscle and breast tissue resulting in unsightly scarring. For apical pneumothoraces the second intercostal space in the mid-clavicular line is sometimes chosen but is not recommended routinely. This position may be uncomfortable for the patient and is more visible if the drain insertion leaves an unsightly scar. It may be the preferred site when using a small drain with an ambulatory drainage system. Loculated apical pneumothoraces are not uncommonly seen following thoracotomy and may be drained using a posteriorly (suprascapular)-sited apical tube. This technique should, however, be performed under image guidance or by an operator experienced in this technique such as a thoracic surgeon. If the drain is to be inserted into a loculated pleural collection, the position of insertion will be dictated by the site of the locule as determined by imaging. Immediately before the procedure the identity of the patient should be checked and the site and side for insertion of the chest tube confirmed by reviewing the clinical signs and the chest x-ray. Once a safe site for chest drain insertion has been identified and prior to the insertion of a drain, the expected pleural contents (air or fluid) should be aspirated with a small needle, usually while administering local anaesthesia. If none is forthcoming, further imaging is required. There is less evidence comparing ultrasound guidance against clinical guidance for chest drain insertion than there is for pleural aspiration. Intuitively, the use of thoracic ultrasound should reduce the risk of drain malposition and complications as the data regarding accuracy of site selection, as described in the pleural aspiration section, is as relevant for chest drain insertion as it is for pleural aspiration. Several studies have successfully used ultrasound-guided small-bore chest drains in the treatment of pneumothorax,46 73 pleural infection46 47 78–80 and pleural effusion46 47 with high levels of efficacy and low complication rates. However, it is difficult to determine the exact contribution of ultrasound as these studies often used mixed modality imaging including CT and fluoroscopy. Ultrasound is useful in guiding the insertion of a chest drain into free-flowing pleural effusions. Keeling47 demonstrated that, in a subgroup of 30 patients, image-guided chest drains were 100% successful in treating simple non-infected pleural effusions. The majority of drains were inserted using ultrasound guidance. However, in one patient the chest drain was incorrectly sited within the subcutaneous tissue and was correctly re-sited using CT guidance. There were no serious complications. Several studies have shown that image-guided small drains are effective in the management of pleural infections, particularly when the effusions are loculated. No studies were found that directly compared image-guided drainage with other methods of treatment such as non-image guided small-bore or large-bore drainage. Moulton et al,79 Keeling et al,47 Cantin et al,85 Silverman et al80 and Akhan et al78 have all used ultrasound guidance to direct small-bore drains for the treatment of pleural infection with a success rate of 73–94%. Ultrasound can be used to direct chest drains into the largest loculation or into two or more separate collections when treating multiloculated effusions with good effect. CT should be used if the abnormalities are poorly visualised on ultrasound.80 Van Sonnenberg et al83 used the greater positional accuracy of image-guided small-bore catheters to successfully treat patients with empyema who had failed management with conventional chest tube drainage. Of the 17 catheters included in the study, 13 were inserted following failure of standard chest tube therapy (of these, 10 were in the wrong position and 2 were in small locules). Overall, image-guided small-bore drains were successful in 13 of the cases (76.5%). Thoracic ultrasound is of limited utility in guiding insertion of a chest drain in the presence of a pneumothorax because of the difficulty in obtaining useful images due to the poor transmission of sound waves through air. Although this is uncommon, estimations of the empyema rate following drain insertions are approximately 0.2–2.4% (tables 2 and 3) for medically inserted chest drains in formal studies but may be higher in routine practice. This may be because, in published studies looking at complication rates, the drains were inserted in dedicated areas in emergency rooms or theatres with full aseptic technique being employed. Infection following chest drain insertion, both cutaneously and within the pleural space, is an avoidable complication of the procedure and we therefore recommend that full aseptic technique including sterile gloves, drapes and gowns is used. We also recommend that chest drains are inserted in a clean area away from sources of contamination and with enough space so that the sterile field can be preserved. This should be separate from a general ward area. Chest drain insertion is described as a very painful procedure by patients and can be improved by better training, use of sedation (see above) and liberal use of local anaesthesia. In centres which undertake medical thoracoscopy, it is recognised that this can be a relatively painless procedure and it is therefore likely that a similar technique applied to chest drain insertion will be successful although there is no evidence to confirm this. Expert opinion is that local anaesthetic is infiltrated into the site of insertion of the drain. A small-gauge needle is used to raise a dermal bleb before deeper infiltration of the intercostal muscles and pleural surface. As the skin, the pleura and periostium are the most sensitive areas, this is where most of the anaesthesia should be infiltrated. A spinal needle may be required in the presence of a thick chest wall, but image guidance is strongly recommended if the pleura cannot be breached by a green needle to ensure localisation of the correct site. Local anaesthetic such as lidocaine (up to 3 mg/kg) is usually infiltrated. Higher doses may result in toxic levels. The peak concentration of lidocaine was found to be <3 μg/ml (ie, low risk of neurotoxic effects) in 85% of patients given 3 mg/kg intrapleural lidocaine. The volume given is considered to be more important than the dose to aid spread of the effective anaesthetic area and therefore a dilute preparation (1% rather than 2%) is preferable. The use of epinephrine to aid haemostasis and localise the anaesthesia is used in some centres but has not been studied in this context. The use of epinephrine allows up to 5 mg/kg lidocaine to be infiltrated. The Seldinger technique to insert a chest tube has become the most widespread method of drain insertion since the publication of the previous guidelines in 2003. In many centres it is the only method of drain insertion on medical wards and many doctors have never been trained to insert a drain any other way. When this technique was introduced it was thought it would be an easier and safer way to insert a drain based mainly on the initial experience by radiologists inserting under ultrasound guidance. The technique can be carried out safely by other doctors as long as they are appropriately trained and familiar with the equipment used in their hospital. A needle is introduced into the pleural space and the pleural contents should be aspirated at this stage to confirm the position of the needle tip in the pleural space. The depth of the needle when it enters the pleural space is noted. A guide wire is passed through the needle which can be used to gently guide the wire to the apex or the base of the pleural cavity as required. The needle is then withdrawn leaving the guide wire in place and a small skin incision is made. The dilator is then passed gently over the guide wire using a slight twisting action. Many of the reported injuries as a result of chest drain insertion were due to visceral puncture by the dilator. Force is unnecessary and the dilator only needs to be passed 1 cm beyond the depth to the pleura as measured with the introducer needle. By holding the dilator firmly at this depth or using a marker available with some kits, excessive insertion depth can be avoided. The tract is further widened by using a series of enlarging dilators up to the size of the drain. The drain is then inserted gently over the wire aiming upwards for pneumothorax or as appropriate for the fluid to be drained. The depth should be enough to ensure the last drainage hole is well within the pleural space (approximately 5–10 cm) but does not require insertion to the hilt. The guide wire is then removed leaving the drain in place. The drain should be stoppered until secured and then connected to a drainage system. Once the anaesthetic has taken effect, an incision is made just above and parallel to a rib. This should be slightly bigger than the operator's finger and tube. Many cases of damage to essential intrathoracic structures have been described following the use of trocars to insert large-bore chest tubes. The use of a trocar to guide a chest drain insertion is associated with the highest complication rates58 and, in a recent study of malpositioned chest tubes, all had been inserted by the trocar technique.86 A trocar should therefore never be used. Blunt dissection of the subcutaneous tissue and muscle into the pleural cavity has therefore become universal and is essential. In one retrospective study87 only four technical complications were seen in 447 cases using blunt dissection. Using a Spencer–Wells clamp or similar, a path is made through the chest wall by opening the clamp to separate the muscle fibres. For a large chest drain (>24 F), this track should be explored with a finger through into the thoracic cavity to ensure there are no underlying organs that might then be damaged at tube insertion. This is essential in the case of thoracic trauma where displacement of internal organs may make insertion of the drain particularly hazardous. Excessive force should never be required during drain insertion. A common complication of drain insertion is accidental removal of the drain, usually as a result of inadequate securing techniques. The drain itself should be secured after insertion to prevent it falling out. Various techniques have been described but a simple technique of anchoring the tube has not been the subject of a controlled trial. The chosen suture should be stout and non-absorbable (eg,’0’ or ‘1-0’ silk) to prevent breaking and it should include adequate skin and subcutaneous tissue to ensure it is secure. Commercially available dressings may also be used which fix to the skin and then attach to the drain. It should be emphasised that, while these dressings are useful for stabilising the drain at the skin and preventing kinking at the skin surface, they do not replace the need to stitch the drain firmly in place. Large amounts of tape and padding to dress the site are unnecessary and concerns have been expressed that they may restrict chest wall movement or increase moisture collection. A transparent dressing allows the wound site to be inspected by nursing staff for leakage or infection. An omental tag of tape has been described which allows the tube to lie a little away from the chest wall to prevent tube kinking and tension at the insertion site (figure 4). In the case of a large-bore drain, a suture for wound closure should be placed at the time of the drain insertion. A ‘mattress’ suture or sutures across the incision are usually employed and, whatever closure is used, the stitch must be of a type that is appropriate for a linear incision. Complicated ‘purse-string’ sutures must not be used as they convert a linear wound into a circular one that is painful for the patient and may leave an unsightly scar. 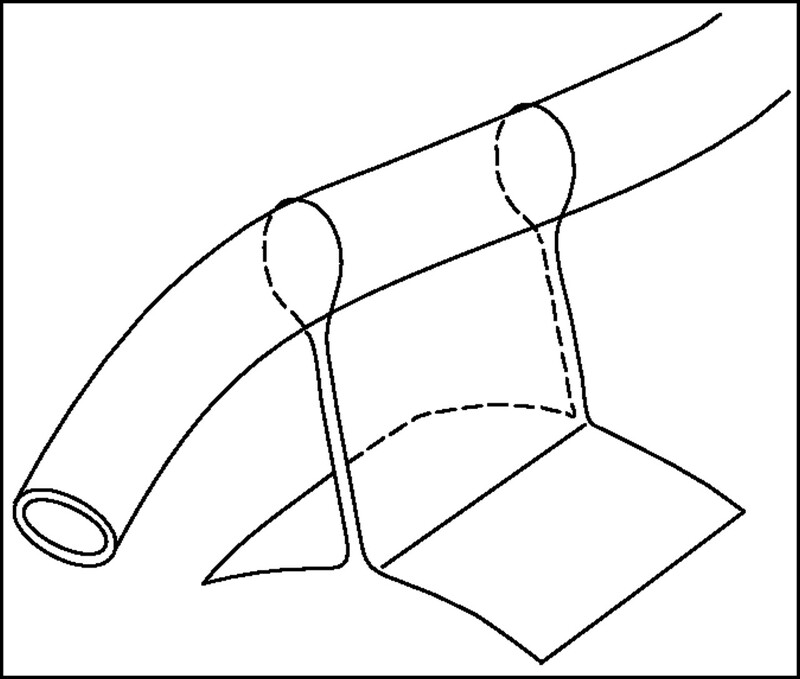 A suture to close the wound is not usually required for small-gauge chest tubes. If possible, the tip of the tube should be aimed apically to drain air and basally for fluid. However, successful drainage can still be achieved when the drain is not placed in an ideal position and therefore effectively functioning tubes should not be repositioned simply because of a suboptimal radiographic appearance. A number of drainage systems are available. The most common is the underwater seal bottle although flutter bags and Heimlich valves have been successfully used to achieve ambulatory drainage and numerous other examples have been described. All drainage systems allow only one direction of flow. The closed underwater seal bottle is a system in which a tube is placed under water at a depth of approximately 3 cm with a side vent with allows escape of air or may be connected to a suction pump. This enables the operator to see air bubble out as the lung re-expands in the case of pneumothorax or fluid evacuation rate in empyemas, pleural effusions or haemothorax. The continuation of bubbling suggests a continued visceral pleural air leak, although it may also occur in patients on suction when the drain is partly out of the thorax and one of the tube holes is open to the air. The inspiratory swing in the tube is useful for assessing tube patency and confirms the position of the tube in the pleural cavity. The disadvantages of the underwater seal system include the obligatory inpatient management, difficulty of patient mobilisation and the risk of knocking the bottle over. The use of integral Heimlich flutter valves has been advocated in the case of pneumothoraces, especially as they permit ambulatory or even outpatient management which has been associated with a success rate of 85–95%. In 176 cases of pneumothorax treated with small chest tubes and a Heimlich flutter valve there were only eight failures (hospital admissions for problems with tube function or placement).89 The average length of inpatient stay has been quoted as 5 h with a thoracic vent and 144 h with an underwater seal, with a cost saving of US$5660.90 Case reports of incorrect use (wrong direction of flow) of such valves have been described, however, with tension pneumothorax as a result. Flutter valves cannot be used with fluid drainage as they tend to become blocked. However, in the UK a similar short hospital stay is achieved by initial aspiration of pneumothoraces (see pneumothorax guidelines). The use of a drainage bag with an incorporated flutter valve and vented outlet has been successfully used postoperatively but has also been used successfully in clinical practice. In the case of malignant pleural effusion drainage, a closed system using a drainage bag or aspiration via a three-way tap has been described to aid palliation and outpatient management. The more recent development of indwelling tunnelled pleural catheters is likely to replace this. Clamping a chest drain in the presence of a continuing air leak may occasionally lead to the potentially fatal complication of a tension pneumothorax. A bubbling drain should therefore never be clamped. It is felt that a general rule not to clamp a drain is the safe approach in most instances to avoid clamping being carried out inappropriately by less experienced clinicians. However, many experienced physicians support the use of clamping of chest drains prior to their removal to detect small air leaks not immediately obvious at the bedside. By clamping the chest drain for several hours followed by a chest x-ray, a recurrence of a pneumothorax may be ruled out. Such a strategy, though not generally recommended, may be acceptable for experienced specialists. The clamped drain should be closely supervised by nursing staff who are familiar with the management of chest drains and who should unclamp the chest drain in the event of any clinical deterioration. In the case of pleural effusions, the volume of fluid drained in the first hour should be a maximum of 1.5 l. After an hour the rest of the fluid may be drained off slowly. The fluid volume should be controlled in this fashion to avoid the risk of RPO (see earlier). If suction is required, this may be done by the underwater seal at a level of 10–20 cm H2O. A high-volume low-pressure system (eg, Vernon-Thompson) is required to cope with a large leak. A low-volume high-pressure pump (eg, Roberts pump) is inappropriate as it is unable to cope with the rapid flow, thereby effecting a situation similar to clamping and risking formation of a tension pneumothorax. A wall suction adaptor may also be effective, although chest drains must be connected to a specialised thoracic suction regulator and not directly to the high negative pressure regulators that are used for other purposes. Patients should be managed on a ward familiar with chest tubes. The appropriate training of the nursing staff is imperative and communication between the medical and nursing staff regarding the chest drain care is vital. If an underwater seal is used, instructions must be given to keep the bottle below the insertion site at all times, to ensure that it is kept upright and that there is adequate water in the system to cover the end of the tube. 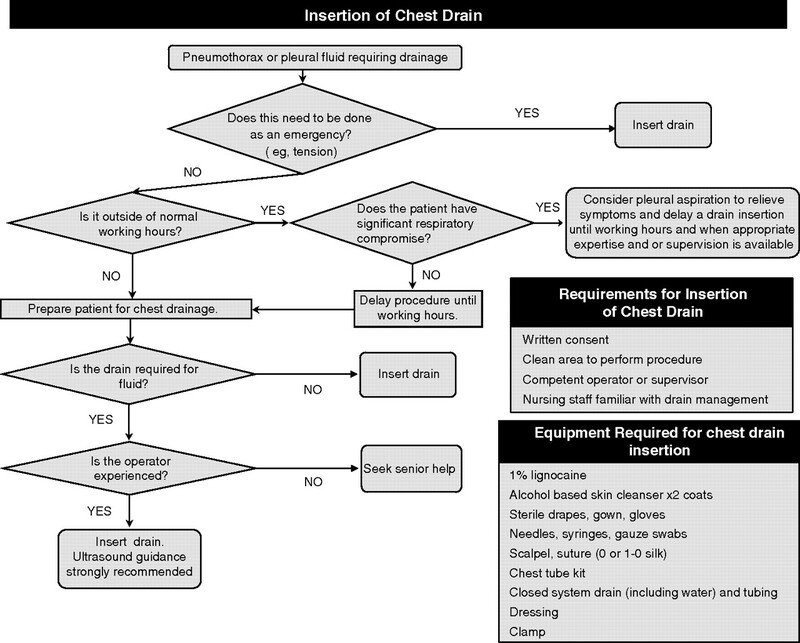 Daily reassessment of the amount of drainage/bubbling and the presence of respiratory swing should be documented preferably on a dedicated chest drain chart. Instructions with regard to chest drain clamping must be given and recorded. Patients should be encouraged to take responsibility for their chest tube and drainage system. They should be taught to keep the underwater seal bottle below the level of their chest and to report any problems such as pulling on the drain insertion site. Educational material (eg, leaflets) should be available on the ward for patients and nursing staff. In the case of pneumothorax, the drain should not usually be removed until bubbling has ceased in the presence of evidence of tube patency and chest x-ray demonstration of re-inflation. Clamping of the drain prior to removal is generally unnecessary. When considering removal of a drain under suction, in trauma patients, a period of water seal only drainage prior to removal probably reduces the rate of recurrence of significant pneumothorax after removal97 although the results of a smaller study dispute this.98 There are no studies to guide medical practice, although it is common practice to allow a period of water seal only drainage after suction and before the drain is removed to check that a pneumothorax does not recur off suction. Medical ultrasound uses sound waves between 2.5 and 12 MHz generated by a transducer to interrogate tissue. The sound waves are attenuated as they travel through tissue. Some or all of these waves are reflected at the interface between tissues where a difference between tissue impedance exists. The returning waves are detected by the transducer and converted into an image. An understanding of the physical laws governing the transmission of sound waves in solids and fluids will facilitate an understanding of the acquired image and optimisation of the scanning technique. Fluid is an excellent conductor of sound waves and appears black on ultrasound whereas air effectively blocks all transmission of sound waves and generates a random snowstorm image. Internal organs such as the liver or spleen have variable echogenicity depending on the proportion of sound waves reflected by the structure. The maximal depth and resolution of an ultrasound image is related to the frequency of the sound waves. Lower frequencies have longer wavelengths and hence better tissue penetration but lower resolution. Higher frequencies have shorter wavelengths which provide higher resolution images and at a greater refresh rate but poor tissue penetration. Ultrasound examination of the thorax is limited by air within the lungs, which is a poor conductor of sound waves, and the acoustic shadow caused by the bony structures surrounding the thorax such as the ribs and scapulae. However, the concept of an acoustic window99 has allowed for effective ultrasound examination of the thorax in the presence of pleural pathology such as a pleural effusion or pulmonary consolidation or tumour abutting the pleura. 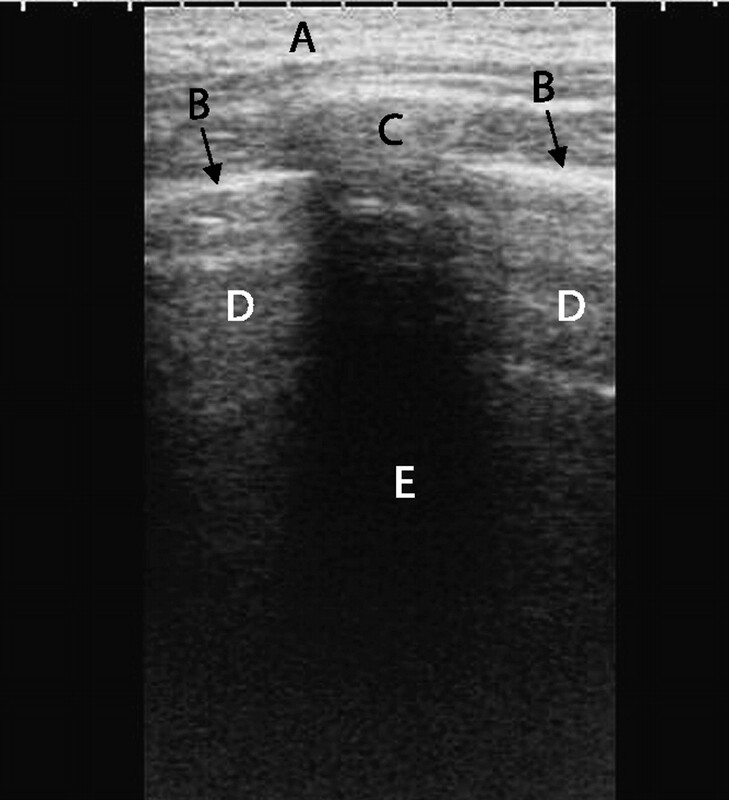 The normal thoracic ultrasound appearance is well described.100–104 With the transducer held in the longitudinal plane, the ribs are visualised on ultrasound as repeating curvilinear structures with a posterior acoustic shadow (figure 5). The overlying muscle and fascia are represented by linear shadows of soft tissue echogenicity. The parietal and visceral pleura is usually visualised as a single echogenic line no more than 2 mm in width which ‘slides’ or ‘glides’ beneath the ribs with respiration when using a low-frequency transducer. Two separate lines can be visualised when using a high-frequency transducer. Normal aerated lung blocks the progression of sound waves and is characterised by a haphazard snowstorm appearance caused by reverberation artefact which diminishes in intensity with distance from the transducer. Comet-tail artefacts can also be seen due to imperfections within the pleura and are best seen at the lung bases. The diaphragms are bright curvilinear structures which move up and down with respiration. The liver and spleen are readily recognised by their characteristic ultrasound appearance below the right and left hemidiaphragm, respectively. Normal lung with acoustic rib shadows: A, soft tissues; B, pleura; C, rib; D, normal lung; E, acoustic rib shadow. Pleural effusions. (A) Large anechoic pleural effusion: A, thoracic wall; B, pleural effusion; C, lung; D, diaphragm. (B) Loculated pleural effusion: A, thoracic wall; B, pleural fluid within a locule; C, wall of locule; D, lung. 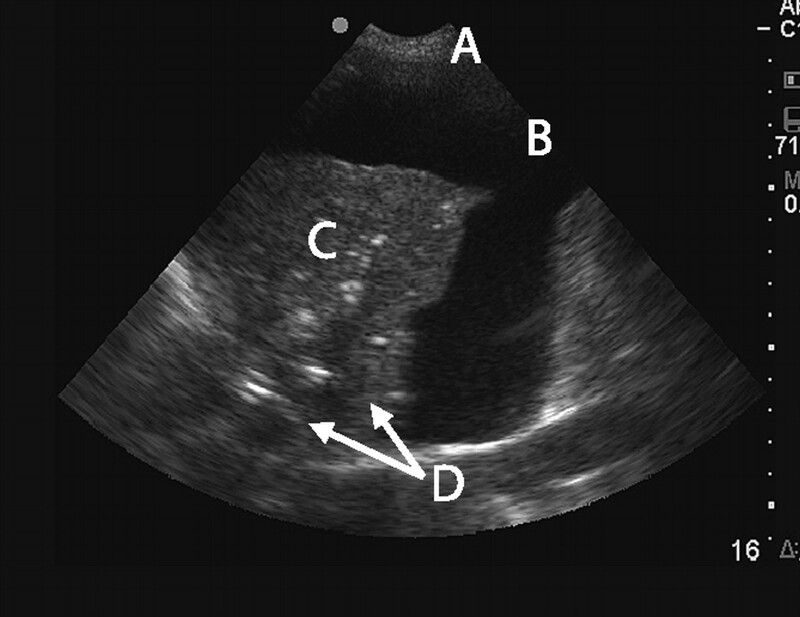 Occasionally a minimal pleural effusion can be hard to distinguish from pleural thickening which may manifest as an anechoic or hypoechoic stripe. The presence of a chaotic linear colour band between the visceral and parietal pleura using colour Doppler has a higher sensitivity for detecting pleural fluid than grey scale ultrasound alone and this is known as the ‘fluid colour sign’.112 113 However, the routine application and interpretation of this is likely to be beyond the expertise of the non-radiologist. Thoracic ultrasound can facilitate the diagnosis of a malignant pleural effusion. The presence of pleural or diaphragmatic thickening or nodularity99 114 or an echogenic swirling pattern in patients with known malignancy115 is highly suggestive of a malignant pleural effusion. Lung consolidation with pleural effusion. A, thoracic wall; B, pleural effusion; C, consolidated lung; D, air bronchograms. The technique for thoracic ultrasound is well described in several review articles102 104 111 and by Koh et al in an online review article containing images and videos.127 The patient should be positioned either in the sitting or lateral decubitus position if critically ill. The chest x-ray should be reviewed before the ultrasound examination. The ambient lighting should be reduced to maximise screen contrast. In general, a 3.5–5 MHz sector transducer provides good views of intrathoracic and upper abdominal structures including pleural fluid. A 5–10 MHz linear transducer should be selected for detailed examination of the pleura. Acoustic gel should be applied between the transducer and the area to be examined. The transducer should be held like a pen, applying firm pressure upon the skin to maximise acoustic coupling while resting the medial aspect of the palm upon the chest. The image should be optimised by adjusting the depth, gain and focus. The depth should be adjusted until the area of interest fills the entire screen, while the gain should be increased or decreased to maximise the contrast between different tissues. Examination should commence with the transducer placed within an interspace on the posterior chest wall on the side of interest. The transducer should be moved obliquely along the interspace (avoiding the acoustic shadow cause by reflection of the ultrasound by the ribs) in both the transverse and longitudinal planes, thereby minimising interference from the acoustic shadow from the ribs. It is imperative that the diaphragm is unequivocally identified before any invasive procedure to avoid inadvertent intra-abdominal penetration. The thorax should be examined posteriorly, laterally and anteriorly, particularly when a loculated pleural effusion is suspected. The thorax should be examined using grey-scale real-time ultrasound, paying particularly attention to location, sonographic appearance and echogenicity.111 The echogenicity of a lesion is defined relative to the liver which, by definition, is isoechoic. The contralateral thorax can be used as a control except where there is bilateral pleural pathology. Once a site has been localised, it should be marked either with an indentation or indelible ink and a mental note made of the maximal depth of fluid present and the required angulation of needle insertion. It is preferable to perform the aspiration at the time of the ultrasound rather mark a spot for subsequent aspiration20 as any alteration of the patient's position may significantly alter the relationship between the skin marker and the underlying pleural fluid.20 21 102 Real-time guidance using a free-hand approach may be necessary in small or loculated pleural effusions. The technique of ultrasound-guided chest drain insertion is similar to that for pleural aspiration. The main purpose of ultrasound is to identify a safe site for aspiration of fluid followed by insertion of the chest drain. The procedure is rarely performed under real-time guidance. Thoracic ultrasound within the critical care setting is especially useful due to the portability of the equipment when treating and diagnosing relatively immobile patients. Erect and, less commonly, decubitus chest x-rays are frequently used to diagnose pleural effusions. However, these views are rarely possible in critically ill patients. Diagnosis of pleural effusions on supine films is much more challenging and frequently inaccurate.128 The use of bedside ultrasound by appropriately trained intensivists has been shown to safely identify and guide aspiration of pleural effusions in mechanically ventilated patients.129 Of the 44 effusions that were aspirated during this study, the pleural effusion was not evident on a supine chest x-ray in 17 cases. Thoracic ultrasound is a very operator-dependent procedure where imaging acquisition and interpretation are carried out simultaneously. There is little evidence to specify the length of training required for a non-radiologist to become competent in basic thoracic ultrasound.130 In the UK the Royal College of Radiologists has published guidelines establishing the minimum standards required to achieve basic or level 1 competency in thoracic ultrasound.131 Although the guideline defines a minimum number of supervised procedures, it should be recognised that some individuals may require more supervision to achieve competency in thoracic ultrasound. An additional 100 scans to achieve level 2 standard or 2 years further experience at level 1 standard would allow the individual to train others to level 1 thoracic ultrasound standard. In practice, more scans are required beyond level 1 competency to achieve a reasonable level of expertise in thoracic ultrasound, particularly where there is loculated pleural fluid. It is advisable for the novice to start with patients with simple free-flowing pleural effusions before moving on to patients with complex pleural or pleuroparenchymal disease.102 The images should be correlated with the CT scan of the thorax or advice should be sought from a radiologist if the individual is unable to interpret the acquired images. National Patient Safety Agency. Risks of chest drain insertion. NPSA/2008/RRR003, 2008 May 15.
. Survey of major complications of intercostal chest drain insertion in the UK. Postgrad Med J 2010;86:68–72. (4).
. Do junior doctors know where to insert chest drains safely? Postgrad Med J 2005;81:456–8. (2−).
. Chest tube insertion: a prospective evaluation of pain management. Clin J Pain 1998;14:152–4. (2+).
. Mastery learning of thoracentesis skills by internal medicine residents using simulation technology and deliberate practice. J Hosp Med 2008;3:48–54.
. Evaluation of the trauma-man® simulator for training in chest drain insertion. Eur J Trauma 2006;32:523–6.
. Lack of increased bleeding after paracentesis and thoracentesis in patients with mild coagulation abnormalities. Transfusion 1991;31:164–71. (2–).
. Pneumothorax after thoracentesis in chronic obstructive pulmonary disease. Heart Lung 1994;23:67–70. (2−).
. Necessity of routine chest roentgenography after thoracentesis. Ann Intern Med 1996;124:816–20. (2+).
. Evaluation of patient-related and procedure-related factors contributing to pneumothorax following thoracentesis. Chest 1999;116:134–8. (2−).
. Asymptomatic hydropneumothorax after therapeutic thoracentesis for malignant pleural effusions. AJR Am J Roentgenol 1998;170:943–6. (3).
. Pathophysiology of pneumothorax following ultrasound-guided thoracentesis. Chest 2006;130:1173–84. (3).
. Management of patients with “ex vacuo” pneumothorax after thoracentesis. Acad Radiol 2005;12:980–6. (3).
. Complications associated with thoracocentesis. Chest 1986;90:97–100. (2−).
. Ultrasound findings following failed, clinically directed thoracenteses. J Clin Ultrasound 1994;22:419–26. (2).
. Lower risk and higher yield for thoracentesis when performed by experienced operators. Chest 1993;103:1873–6. (3).
. Thoracentesis without ultrasonic guidance infrequent complications when performed by an experienced pulmonologist. J Bronchol 2005;12:200–2. (2−).
. Complications associated with thoracentesis. A prospective, randomized study comparing three different methods. Arch Intern Med 1990;150:873–7. (1−).
. Factors affecting the development of pneumothorax associated with thoracentesis. AJR Am J Roentgenol 1991;156:917–20. (2−).
. Value of chest ultrasonography versus decubitus roentgenography for thoracentesis. Am Rev Respir Dis 1986;133:1124–6. (1).
. Sonographically guided thoracentesis and rate of pneumothorax. J Clin Ultrasound 2005;33:442–6. (2−).
. Ultrasound study in unilateral hemithorax opacification. Image comparison with computed tomography. Am Rev Respir Dis 1993;147:430–4. (2−).
. Chest ultrasound for “dummies”. Chest 2003;123:332–3. (4).
. Intercostal artery laceration during thoracocentesis: increased risk in elderly patients. Chest 1979;75:520–2. (3).
. Pneumothorax and the value of chest radiography after ultrasound-guided thoracocentesis. Acta Radiol 2004;45:828–32. (2−).
. Pleural depth in medical patients. Chest 2009;136:948–9. (3).
. Chest wall thickness in military personnel: implications for needle thoracentesis in tension pneumothorax. Mil Med 2007;172:1260–3. (3).
. Needle thoracostomy in the treatment of a tension pneumothorax in trauma patients: what size needle? J Trauma 2008;64:111–14. (3).
. Large-volume thoracentesis and the risk of reexpansion pulmonary edema. Ann Thorac Surg 2007;84:1656–61. (2−).
. Complications following ultrasound-guided thoracocentesis. Acta Radiol 2004;45:519–22. (3).
. Ultrasound-guided thoracentesis: is it a safer method? Chest 2003;123:418–23. (2).
. Reexpansion pulmonary edema. Ann Thorac Surg 1988;45:340–5. (3).
. Amount drained at ultrasound-guided thoracentesis and risk of pneumothorax. Acta Radiol 2009;50:42–7. (2−).
. Ipsilateral reexpansion pulmonary edema after drainage of a spontaneous pneumothorax: a case report. J Med Case Reports (Electronic Resource) 2007;1:107. (3).
. Re-expansion pulmonary oedema following spontaneous pneumothorax. Respir Med 1996;90:235–8. (3).
. Reexpansion pulmonary edema after treatment of pneumothorax. N Engl J Med 2006;354:2046. (3).
. Reexpansion pulmonary edema after VATS successfully treated with continuous positive airway pressure. Ann Thorac Surg 2000;70:669–71. (3).
. Clinical analysis of reexpansion pulmonary edema. Chest 1991;100:1562–6. (3).
. The relationship of pleural pressure to symptom development during therapeutic thoracentesis. Chest 2006;129:1556–60. (2−).
. Limited utility of chest radiograph after thoracentesis. Chest 2000;117:1038–42. (2−).
. Chest roentgenography after outpatient thoracentesis. Mayo Clin Proc 1998;73:948–50. (3).
. Pigtail tube drainage in the treatment of spontaneous pneumothorax. Am J Emerg Med 2003;21:241–4. (3).
. Efficacy and complications of small-bore, wire-guided chest drains. Chest 2006;130:1857–63. (2−).
. Empyema and effusion: outcome of image-guided small-bore catheter drainage. Cardiovasc Intervent Radiol 2008;31:135–41. (3).
. The pigtail catheter for pleural drainage: a less invasive alternative to tube thoracostomy. JSLS 1999;3:57–61. (3).
. Study of pigtail catheters for tube thoracostomy. Armed Forces Med J India 2006;62:40–1. (3).
. Treatment of pneumothoraces utilizing small caliber chest tubes. Chest 1988;94:55–7. (3).
. A study of the complications of small bore 'Seldinger' intercostal chest drains. Respirology 2008;13:603–7. (3).
. Analysis of tube thoracostomy performed by pulmonologists at a teaching hospital. Chest 1997;112:709–13. (2−).
. Pre-hospital and in-hospital thoracostomy: indications and complications. Ann R Coll Surg Engl 2008;90:54–7. (2−).
. Complications of tube thoracostomy in trauma. J Accid Emerg Med 2000;17:111–14. (3).
. Complications after emergency tube thoracostomy: assessment with CT. Radiology 1995;195:539–43. (3).
. Chest tube complications: how well are we training our residents? Can J Surg 2007;50:450–8. (3).
. The risk of percutaneous chest tube thoracostomy for blunt thoracic trauma. Ann Emerg Med 1985;14:865–70. (3).
. Morbidity of percutaneous tube thoracostomy in trauma patients. Eur J Cardiothorac Surg 2002;22:673–8. (2+).
. Tube thoracostomy. Factors related to complications. Arch Surg 1995;130:521–5. (3).
. Complications of intercostal catheter insertion using EMST techniques for chest trauma. Aust NZ J Surg 2004;74:420–3. (3).
. Complication rates of tube thoracostomy. Am J Emerg Med 1997;15:368–70. (3).
. Use of presumptive antibiotics following tube thoracostomy for traumatic hemopneumothorax in the prevention of empyema and pneumonia–a multi-center trial. J Trauma 2004;57:742–8. (1−).
. Cefamandole for prophylaxis against infection in closed tube thoracostomy. J Trauma 1981;21:975–7. (1+).
. Posttraumatic empyema. Risk factor analysis. Arch Surg 1997;132:647–50. (2−).
. Antibiotic prophylaxis is indicated for chest stab wounds requiring closed tube thoracostomy. Br J Surg 1993;80:464–6. (1+).
. Antibiotic prophylaxis in penetrating injuries of the chest. Ann R Coll Surg Engl 1991;73:348–51. (1−).
. Preventive antibiotic usage in traumatic thoracic injuries requiring closed tube thoracostomy. Chest 1994;106:1493–8. (1+).
. Role of prophylactic antibiotics for tube thoracostomy in chest trauma. Am Surg 1998;64:617–20. (1+).
. Prophylactic antibiotics for the prevention of infectious complications including empyema following tube thoracostomy for trauma: results of meta-analysis. J Trauma 1992;33:110–16. (1+).
. Meta-analysis of antibiotics in tube thoracostomy. Am Surg 1995;61:215–19. (1−).
. Treatment of malignant pleural effusion: pleurodesis using a small percutaneous catheter. A prospective randomized study. Respir Med 1998;92:593–6. (1−).
. Comparative analysis of the Bonanno catheter and tube thorocostomy in effective aspiration of pleural effusion. Heart Surg Forum 2006;9:E731–4. (2−).
. Pneumothorax: radiologic treatment with small catheters. Radiology 1988;166:89–91. (2−).
. Comparison of large- and small-bore intercostal catheters in the management of spontaneous pneumothorax. Intern Med J 2003;33:495–9. (2−).
. Comparison of a large and small-calibre tube drain for managing spontaneous pneumothoraces. Respir Med 2009;103:1436–40. (3).
. Pigtail catheters used for percutaneous fluid drainage: comparison of performance characteristics. Radiology 2006;238:1057–63. (2).
. Use of small-bore vs large-bore chest tubes for treatment of malignant pleural effusions. Chest 2001;120:19–25. (3).
. Image-guided catheter drainage of infected pleural effusions. Diagn Interv Radiol 2007;13:204–9. (3).
. Controlled trial of intrapleural streptokinase for pleural infection. N Engl J Med 2005;352:865–74. (3).
. Intrapleural fibrinolytics combined with image-guided chest tube drainage for pleural infection. Mayo Clin Proc 2007;82:407–13. (3). Academy of Medical Royal Colleges. Implementing ensuring safe sedation practice for healthcare procedures in adults. London: Academy of Medical Royal Colleges, 2001.
. Chest tube drainage under radiological guidance for pleural effusion and pneumothorax in a tertiary care university teaching hospital: review of 51 cases. Can Respir J 2005;12:29–33. (3).
. Incidence of chest tube malposition in the critically ill: a prospective computed tomography study. Anesthesiology 2007;106:1112–19. (2+).
. Complications of tube thoracostomy for acute trauma. Am J Surg 1980;140:738–41. (3).
. Diagnosis of malpositioned chest tubes after emergency tube thoracostomy: is computed tomography more accurate than chest radiograph? Clin Imaging 2005;29:401–5. (3).
. Outpatient chest tube management. Ann Thorac Surg 1997;64:1437–40. (3).
. The cost of treatment of spontaneous pneumothorax with the thoracic vent compared with conventional thoracic drainage. Chest 1996;110:303. (3).
. A prospective randomized controlled trial of suction versus non-suction to the under-water seal drains following lung resection. Eur J Cardiothorac Surg 2005;27:391–4. (1+).
. Suction vs water seal after pulmonary resection: a randomized prospective study. Chest 2002;121:831–5. (1−).
. Potentially dangerous negative intrapleural pressures generated by ordinary pleural drainage systems. Chest 2001;119:511–14.
. Suction versus water seal after thoracoscopy for primary spontaneous pneumothorax: prospective randomized study. Ann Thorac Surg 2003;75:1593–6. (1−).
. Preliminary report of a prospective, randomized trial of underwater seal for spontaneous and iatrogenic pneumothorax. J Am Coll Surg 2007;204:84–90. (1−).
. Chest tube removal: end-inspiration or end-expiration? J Trauma 2001;50:674–7. (1−).
. Prospective randomized trial of thoracostomy removal algorithms. J Trauma 1999;46:369–71. (1−).
. Randomized study of algorithms for discontinuing tube thoracostomy drainage. J Am Coll Surg 1994;179:553–7. (1−).
. Pleural effusion: an “acoustic window” for sonography of pleural metastases. J Clin Ultrasound 1991;19:93–7. (3).
. Transthoracic ultrasound. Respiration 2003;70:87–94. (4).
. Transthoracic ultrasound for the pulmonologist. Curr Opin Pulm Med 2005;11:307–12. (4).
. Ultrasound in the diagnosis and management of pleural disease. Curr Opin Pulm Med 2003;9:282–90. (4).
. Real-time chest ultrasonography: a comprehensive review for the pulmonologist. Chest 2002;122:1759–73. (4).
. Quantification of pleural effusions: sonography versus radiography. Radiology 1994;191:681–4. (2−).
. The sonographic appearances of pleural fluid. Br J Radiol 1993;66:619–24. (3).
. Non-traumatic thoracic emergencies: imaging and treatment of thoracic fluid collections (including pneumothorax). Eur Radiol 2002;12:1922–30. (4).
. Value of sonography in determining the nature of pleural effusion: analysis of 320 cases. AJR Am J Roentgenol 1992;159:29–33. (2+).
. Usefulness of ultrasonography in predicting pleural effusions >500 mL in patients receiving mechanical ventilation. Chest 2005;127:224–32. (2−).
. Quantitative assessment of pleural effusion in critically ill patients by means of ultrasonography. Crit Care Med 2005;33:1757–63. (2−).
. Clinical applications of transthoracic ultrasound in chest medicine. J Med Ultrasound 2008;16:7–25. (4).
. Image comparison of real-time gray-scale ultrasound and color Doppler ultrasound for use in diagnosis of minimal pleural effusion. Am J Respir Crit Care Med 1994;150:510–14. (2+).
. Color doppler ultrasound of pulmonary consolidation. Eur J Ultrasound 1996;3:169–78. (4).
. Thoracic ultrasound in the diagnosis of malignant pleural effusion. Thorax 2009;64:139–43. (2+).
. Echogenic swirling pattern as a predictor of malignant pleural effusions in patients with malignancies. Chest 2004;126:129–34. (2−).
. Ultrasonographic evaluation of pulmonary consolidation. Am Rev Respir Dis 1992;146:757–62. (2−).
. Thoraxsonography–Part II: Peripheral pulmonary consolidation. Ultrasound Med Biol 1997;23:1141–53. (4).
. Sonographic septation: a useful prognostic indicator of acute thoracic empyema. J Ultrasound Med 2000;19:837–43. (2).
. Image-guided percutaneous drainage of thoracic empyema: can sonography predict the outcome? Eur Radiol 2000;10:495–9. (2).
. Percutaneous drainage of thoracic collections. J Thorac Imaging 1998;13:74–82. (4).
. Ultrasonographic approach to diagnosing hydropneumothorax. Chest 1992;101:931–4. (3).
. Accuracy of transthoracic sonography in excluding post-interventional pneumothorax and hydropneumothorax. Comparison to chest radiography. Eur J Radiol 2005;53:463–70. (2).
. Ultrasound detection of pneumothorax. Clin Radiol 1999;54:736–9. (2−).
. COPD can mimic the appearance of pneumothorax on thoracic ultrasound. Chest 2006;129:545–50. (2).
. Transthoracic US of the chest: clinical uses and applications. Radiographics 2002;22:e1. (4).
. Accuracy of the diagnosis of pleural effusion on supine chest x-ray. Eur Radiol 1997;7:57–60. (2).
. Feasibility and safety of ultrasound-aided thoracentesis in mechanically ventilated patients. Intensive Care Med 1999;25:955–8. (2−).
. Safety of ultrasound-guided thoracentesis in patients receiving mechanical ventilation. Chest 2004;125:1059–62. (2+). Faculty of Clinical Radiology. Ultrasound training recommendations for medical and surgical specialities. London: Royal College of Radiologists, 2005.
. Rapid, inexpensive real-time directed thoracentesis. Radiology 1983;146:545–6. (3).
. Thoracocentesis. Clinical value, complications, technical problems, and patient experience. Chest 1987;91:817–22. (2+).
. Indwelling small pleural catheter needle thoracentesis in the management of large pleural effusions. Chest 1997;111:981–8. (3).